This Page will include farm toys of Oliver, Minneapolis Moline, Cockshutt and Co-op. 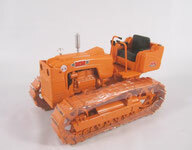 They will include tractors and implements made by Ertl Collectibles, JLE Scale Models and Spec Cast. SpecCast Stk# SCT 144 MM Puller. Large 1/16 scale (8-1/2 in long) die-cast. Made for the 1997 Louisville Show New in Box.